The laboratory procedure to find out the metacentric height of a floating body on water is briefly explained in this article. 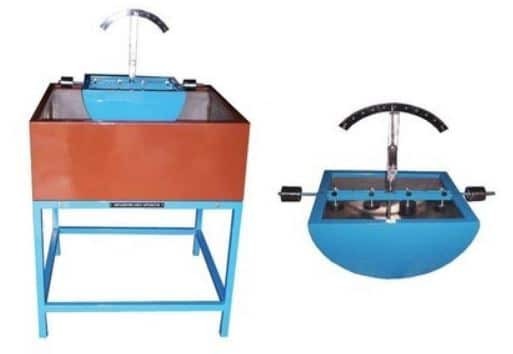 Following are the apparatus required to measure metacentric height of a floating body. A Floating Ship which contains horizontal beam at its middle and a movable pointer on a graduated scale at the center of horizontal beam. Take an empty tank and fill it with water up to 2/3rd of its height and note down the height of water level (Z1). Now place the floating ship and water level in the tank rises to (Z2) and note it down. Adjust the floating ship in such a way that the pointer should show zero reading on the graduated scale. After adjusting, add weight (w1) to the horizontal beam of floating ship at a known distance (Y) from the center of beam. Now the ship will tilt to some angle on one side and observe the tilt angle on graduated scale and note it down. Repeat the same procedure for 4 more times by keeping the load constant and varying the distance or by keeping the distance constant and varying the load. In this case distance is kept constant as (Y) and weight is varied. Finally calculate the metacentric height using given formula. Calculate metacentric height for 5 different weights and take the average as a result.